Keith got a call last night from Duval's foster mom and she asked us "So when do you want to come pick up your dog?!" We are so excited! On Saturday, a local FBRN rep came to do a home visit and brought her dog Betty. She had a few comments regarding dog safety and then she was on her way. She told us we would hear back within a few days after they all deliberated, so I didn't expect a call so soon. Duval's foster mom is on her way to Massachusetts for a dog show on October 10th, so she's going to actually meet us at our house to drop him off all the way from Florida! This is perfect timing because now we can buy all his stuff and get everything ready for his arrival. Today, my friends and are going to take a walk down to the chic doggie store and do some window shopping. We had a 2 hour phone interview last night with Duval's foster mom. We learned all about him and why he was surrendered. He is healthy, no breathing problems, is allergic to corn and wheat, and has gained weight since switching to Merrick dog food. There are 3 other candidates for Duval, but our application is strong and the only disadvantage is that Duval would be great for a house with multiple dogs because he's so playful. We have plenty of dogs in our neighborhood that he would never be lonely. So now it's on to the home visit. After we got off the phone with the foster mom, we heard from the local rep of FBRN who is going to conduct the home visit. I'm so excited!!! I hope he's ours!!! I went back to the website the day after we put in our application and there was a PENDING banner over Duval! Yippee! It takes 4-6 weeks for them to review the application, so we're waiting patiently now. In the mean time, we're reading books about french bull dogs especially ones that have been rescued. Separation anxiety is high on the priority list. We're making preparations to get him in Florida, take him to the vet, deciding how to introduce his new home to him. Check out some of those other beauties who need a home! I hope we're the lucky ones! Picking a name is hard work! The hubs and I had such conflicting opinions of what and how a dog should be named. We threw so many ideas in the air, all of which got nixed. We checked back with the FBRN website and saw new doggies up for adoption. I went through their bios and found "Duval". This is his description from their website and he sounded puurrfect for us! I gathered all the appropriate information to fill our adoption application and sent it in right away! Duval, I hope we're the lucky parents! "Duval is a darling youngster who was surrendered when his owner lost his job and felt he could not longer give Duval what he needed. Duval is still really a baby at just 15 months, but he is already a first class pet – absolutely top drawer. Though he had some minor skin issues when he came to us, those are all cleared up now and Duval has a beautiful healthy coat of luxurious brindle. We stole his jewels while he wasn’t looking and now he’s all ready to go. 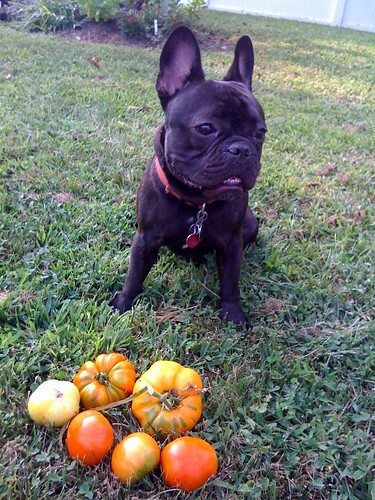 Duval has a perfect personality for a Frenchie, and given that he is so young it’s really pretty extraordinary. He loves to play but does not have nutso puppy energy, in fact, he’s just as happy to sit by you or in your lap and gaze at you adoringly. He loves dogs and plays nicely with all shapes and sizes and he loves people, too, kids included. We haven’t tested him with cats, so we’ll say not to those. He has no temperament issues of any kind. Duval likes to chew on a bone, watch t.v., play with dogs, and take nice rambles around the neighborhood with his people. He is crate trained and housetrained as long as he is kept on a good schedule. He has never had an accident in his crate. What a good boy! Duval is an excellent listener and knows how to sit, come and wait even though he has had no formal training. He might be a genius! Duval would do well in many kinds of homes – house, apartment or townhome. If he lives in a house we’d prefer a fenced yard, but as long as he gets nice walks he is fine. He would love playing in a friendly dog park, too. Duval is well-rounded and very social and would be a nice take to work companion. He is gentle and easy and could live with children as well as adults. He loves to play with other dogs, so a home with a canine companion would be great. Can you spell PERFECT? We spell it this way D-U-V-A-L! If you know a good thing when you see it and can give Duval lots of love and a good home then sharpen your pencil and fill out an application today. And if you are lucky enough to take him home, be sure to plan on coming in person. Mr. Perfect is waiting for you in Florida, and he will not be shipped!" 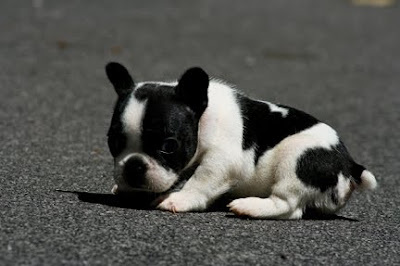 We inquired about this little black and white frenchie from Bully Buddies. I thought she looked like a cow, but what caught our eye was what looked like a thunderbolt on her left back side in white. Keith really wanted her and I agreed to inquire about her because of the thunderbolt on her back. If we got her, we would call her "Bolt". A few days later, BB got back to us and said Esther was spoken for. I was so heart broken. I had already begun picturing this year's Christmas photo with her. We hope she's happy in her new home with Marcia! I have to admit I was one of those people who did not know the "evils" of puppy mills and pet stores. I grew up in NYC where green grass and trusted breeders were rare. I never questioned where the fancy dogs in their Louis Vuitton carrriers were from. We had a large PETSMART store in my area and that's where I figured everyone went for a pet just like my goldfish. My husband and his family, on the other hand, grew up with pets from breeders and shelters. Combining all the this information, we took our time (3 years) mulling over the idea of getting a dog. 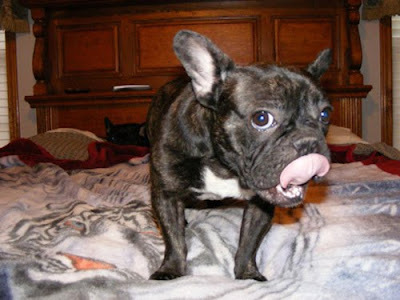 Two websites that were referred to us was Next Day Pet and French Bulldog Rescue Network. Next Day Pet is an online "mall" of adorable puppies from breeders. French Bulldog Rescue Network is a non-profit organization that takes in discarded dogs and nurses them back to health to be adopted. We went back and forth between the cute brand new puppy pictures on NDP and the sad stories on FBRN. Oh, how it pulled on our heart strings! Do we get a rescued dog with possible problems and trauma or do we go for the cute, wrinkly, new puppy that needs training and a hefty price tag? Being that we would still have to learn how to train a dog and read more about frenchies, we decided to wait and check back with FBRN until a dog came along that we were ready for. After dog sitting Tego, he convinced us that it was time that we started a family of our own. He brought us so much joy and entertainment in the two weeks he stayed with us that we wanted a little frenchie of our own. For our lifestyle, a frenchie fits us well and we don't mind a dog that needs some extra special attention to their health. I started by doing some searches on the internet and asking friends and neighbors who have dogs both from breeders, shelters and rescue networks. We asked questions and got opinions about everything. 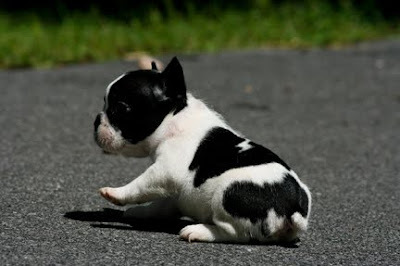 We read up on the needs of a french bulldog before deciding if this is really the type of dog for us given their needs and possible issues - health, behavior, care, temperament, and training. -did I mention they are uber cute! ?